I have been fortunate to be invited to compete in the Vitalmax NABBA CZECH OPEN 17th October 2009. This is an all expenses paid trip along with prize money at the contest of $20k with the money split between 1st - 6th place. It is a great honour to compete for Vitalmax, and I would like to take this oppertunity to thank all involved in team Vitalmax and their sponsership. Prior to this date I am also preparing to compete at one of the best (in my opinion) UKBFF comps, the UKBFF Midlands on 20th September 2009. I would like to record my workouts, diet and supplement prep as a record and possibly an aid to others and to myself to reflect upon along my progress. 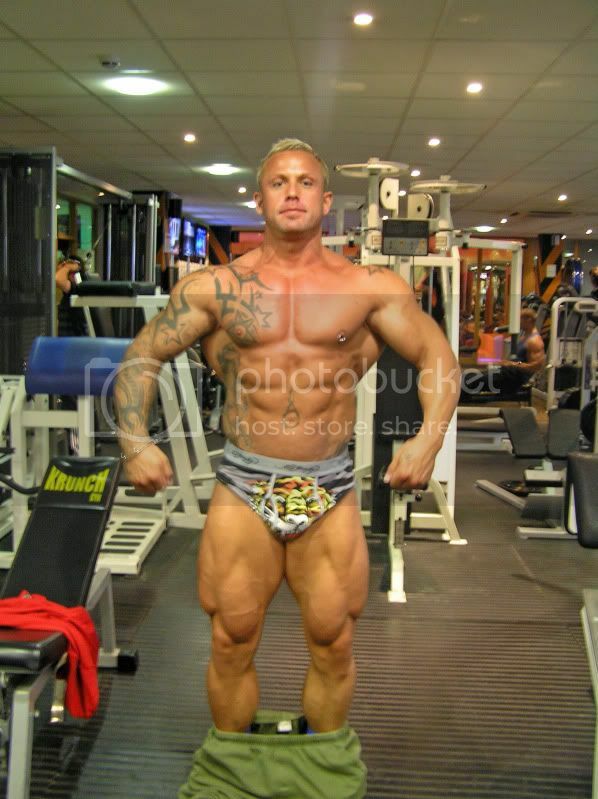 As the owner of KRUNCH GYM, Waltham Abbey, Essex I am constantly being asked for advice and help and receantly helped 3 members place 1st, 1st and 5th respectively at the recent NABBA SE. I have been competing for many years at bodybuilding at various levels both at home and abroad. Competing in the USA and Australia along with being fortunate to be on the GB musclemania team competing in Hungary.....the United Kingdom NAC Team competing in the World championships and the Mr Universe competitions held in Greece & Germany. NAC Mr UNIVERSE 2008 GERMANY.. 10th Place I made the transition from ANB natural comps after a life threatning accident meant any training would have to come to an end. I am a firm believer in the mind being the most powerfull muscle. I suffered a serious motorbike accident some 5 years ago that paralysed me from the kneck down for 48 hours. That's alot of time to contomplate life! From that the surgeons told me I would never write again or use my arms for lifting weights due to how shattered they were, let slong compete. 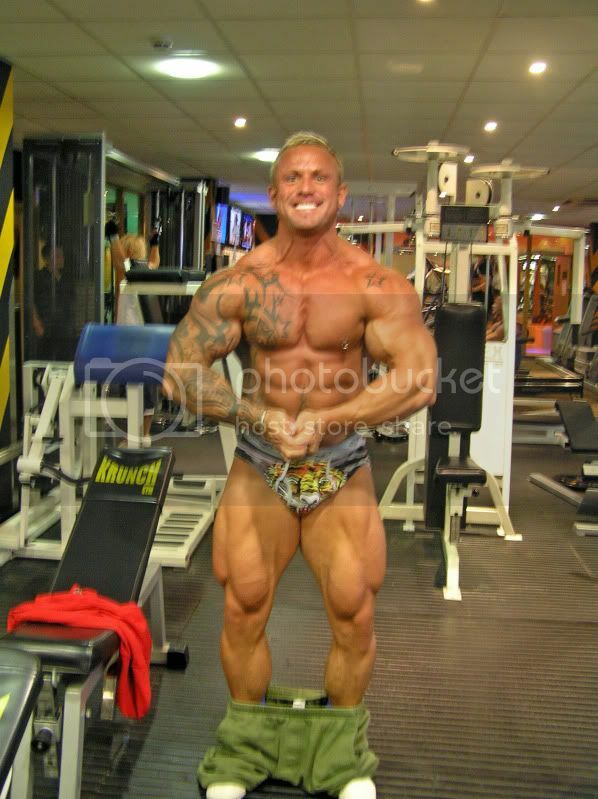 Several plates & pins later and a rigerous Physio routine recovered my movement and my positive mental attitude made my comeback to compete and win the Mr Titan in 2006 my most rewarding competition to date! So that's enough on me and my background, but worth sharing with you all as its been some time since I have posted regularly and hope it has built a better picture as to the person I am. So now onto the prep!! Most bodybuilders dread the diet side of prepping, I am no different, I love my food especially Nandos & their peri peri chips! Plus Prezzo pizza and their honeycomb cheesecake are outstanding! My mouth is almost watering at the thought of them, still I eat that type of food 1-2 x per week off season on my days off training. The remainder of my off season diet is very similar to my contest diet at 12 weeks out, very strict bodybuilding foods, although carb portions are not counted and I would include the addition of healthy fats. Udoschoice oil is excellent, along with fish oils and raw nuts. I believe a bodybuilder should look like a bodybuilder year round and not be totally devoid of definition. This type of clean eating had allowed me to a fairly lean off season look with a bodyweight of 18 & 1/2 stone. So typically I believe in cleaning my diet up at 15 weeks out. Removing excess sauces, refined carbs and of course treats! In order to change my mindset for the controlled eating ahead. Training 5 days per week. Under 130bpm done 1st thing in morning on empty stomache, daily. For me this diet was great in that the calories are kept high and the fats make the food digestion very controlled and thus no hunger pains! High calories should maintain high muscle mass! However although I was never hungry and rarely craved, my stomache after 3 weeks could not constantly digest the large amount of nuts and thus began to feel uncomfortable and bloated from meal 1. This is most probably due to my IBS and the fact that certain foods I am allergic to prevented me having much variation. I have found that if personally I eat too much of one food type I will soon build up problems utilising the food and IBS discomfort will follow. A real shame as a great easy diet that never left me feeling hungry or tired or snappy, like traditional comp prep diets are known for. As a side note- I have put many clients in and out my gym on this type of diet, amounts specific to the persons activity and bodyweight with FANTASTIC results! So well worth a try! So through the 3 week Keto diet my bodyweight dropped by 9lbs. Approx 3lb per week, an ideal fatloss amount, of course a good amount of initial weight loss on this diet will be from water! So at 12 weeks and ready to start a traditional reducing carb diet I weighed 17stone 10lb. due to being allergic considerably to egg White and milk these foods are ommitted from the diet totally, this includes protein powder blends. diet coke when needed to fend off any sweet cravings! Been meaning to get down you gym for a loooong time, will be a good prep to follow. How come your not with myprotein anymore? All the best woth your prep...great physique!!! great physique, will be a good journal to follow. will you be putting up any photos of when you started and your progress? Great physique and you have a string of good shows behind you too. cracking start to a journal!!!! all the best, will be following this! And thanks for the comments / words of inspiration.. all helps with the long haul of a diet and prep!! I always clean up my diet prior to competing and the usual prep starts at 12 weeks. So this year I used the Palumbo diet for weeks 15-12 but after that time it started to upset my body. Bloated from the 1st meal is no fun!!! not great 4 me altho I still maintain a great diet for many others! So the diet Im following, above is more conventional, lower carbs, high enough protein and lowering cals as the weeks go on. Generally I stick with the exact same foods and cals for approx 2 weeks then asses and change to slightly lower amounts of carbs or fats to keep the fat/weight loss going. Due to low cals, I have always been a big believer in supplementing, especially crucial when dieting as the nutritional needs are not being covered from foods and calories... the tightrope we walk as a dieting bodybuilder is very slim slip from fat loss to muscle loss (even using high amounts of AAS). Off season though, I do tend to use only a very limited amount of supplements due to the high quality foods I eat in their place! 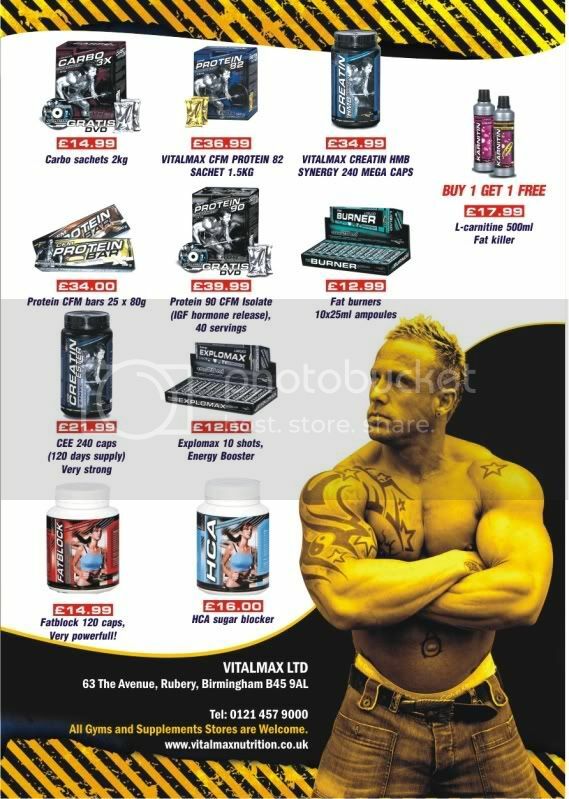 I have been with myprotein for some years, but unfortunatly the opening of my own gym and sale of mainstream products as a businessman and not being able to sell myprotein through the gym, possibly due to the packaging or taste or peer pressure from other consumers to use certain brands meant a slight fall out of favourtism between myself and myprotien. Also the fact the running a brand new gym business took so much of my time has meant I have been unable to contribute etc to the Myprotein brand and thus we after 4 good years together have gone are own ways..!!! Still, their range has grown as has their company and Im wish oliver and the team the best of luck.! However every cloud has a silver lining, and from their I have been fortunate to meet and join the VITALMAX team , including Rob Ronaldo, and good friend Robbie Anchant - along with Pro Pavol Jablonicky...! I had been using the range anyway and believed some of the supplements they stock awesome in effects, especially when dieting... The L Carnatine liquid and Creatine HMB are real beneficial I believe in aiding fat loss prior to any exercise and recovery when on a low cal diet... Plus the fact that VITALMAX CFM Isolate 90 is in individual serving packets makes my life on the road so much more conveniant!! I have had some photos taken in the gym and will be posting them very soon. This I will be doing weekly to show any changes made.. I will also be including workouts , weight, reps, cardio and changes of pace etc to try and give a good idea of the protocal I adhere to. I have been training well receantly following a fractured spine and slipped disc. I injured myself some 6 months back and through much physio have resolved the issue as much as I can, well enough to squat again, albeit slightly less weighty still. After having various MRI scans and CT scans I have now seen the fracture heal and rather than feel down about the injury some 6 months back, I used this time to dial my mind into competing at the Leamington Spa as a means to drive me onward and through the recovery process..
And its progress enough to be able to keep up with the rigous of dieting. training and cardio-ing! my typical week at 12 weeks out training looks like this. The photos below are taken 12 weeks out, at start of real dieting, after 3 weeks of just cleaning up foods. the idea is slightly reduce cals and eat even cleaner foods as the dieting process continues. For me this works best both mentally and physically allowing to see continued changes on myself as the weeks go on. Afterall dieting is a mentally tough process and seeing small steps continuelly in the right direction makes the process feel more worthwhile and acheiveable! I have found by increasing these days actually helps the fat and weight still keep coming off rather than allowing the metablosim to adjust and slow the weight loss. Also it refreshes me mentally to contiue on the diet. 70kg for reps in the DB Press is impressive, don't see many doing that! is that lemington ul be doing mate? is it a decent show then? was wondering if u could look at my diet and critique plz? Every other day I do 30min brisk walk before bed. Hi Neal thanks for answering re sponsors. Good to know it wasnt a bad split. Thanks mate for the kind words. I actually am one of those bodybuilders that stay lean through diet and cardio off season to maintain a resembelance of shape! Normally compete around 16 1/2 stone and off season 18 1/2 stone. This year is the heaviest I been off season with the same kind of condition. I put the extra stone on and maintained it easily with the use of vitalmax CFM 90 isolate with breakfast, pre and post training an prior to bed. Combining the vitalmax isolate with genr8 Vitargo b4 & after training made huge gains in size and strength I'm sure! Plus this year I been usin creatin hmb by vitalmax pre and post training along with taurine and boy the strength and energy surge I got has been remarkable. I used creatine some 5-6 years back as monohydrate and it worked well but never seemed to work again, no matter what amount I used or even using a ethyl ester never done a thing but this vitalmax creatine hmb is a kockout, ESP with the taurine and cheap as chips! This year I'm going to keep using right through to comp week as neither hold any water even though this is the 1st year for many I'm getting my comp weight under 100kg to compete in the new ukbff u/100 in leamington spa! Things tightening up almost daily now it seems which is nice I will be posting pics mon! And from mon I'll be doing a new angle on comp dieting for me, thanks to advice from DAVE KINGHAM a great diet guru and masters athlete. From mon for one week I will really drop the food amounts and carbs by nearly a half what I normally eat as a body shock, weight drop and as a easy way to coast into the comp. As after one week on real low carbs an feeling hungry I return to the diet I currently follow and the amounts will seem plentyfull rather than the strict amounts a diet normally feels like. yes the leamington always has had a good standard and good number of competitiors ready to qualify for the BRITISH FINALS , its a good indication of you will fair at the finals I think, rather than a smaller turnout qualifier such as the South East. NO NEED TO TAKE BCAA AT SAME TIME AS A GOOD WHEY PROTEIN SUCH AS VITALMAX CFM 90 AS IT CONTAINS LARGE AMOUNTS!! ADD SOME CARBS TO THE DIET!!!! THEY ARE NOT THE ENEMY!!! by having extra carbs from 100g oats on wed my legs workout the following day, thurs, has stayed great, strong and full throttle and by allowing myself an indulge in 2 tspn of peanut butter on 4 extra oatcakes made going to cinema sun nights or watching a dvd with a 'normall-ish' type treat food, that doesnt reset my taste buds!! This is advice Dave Kingham suggested and its seems good so far!! here ar two shots at 8 1/2 weeks out! Now after hitting the 7 week mark I weigh 16stone 12lb my goal weight at this stage - so far all on track. The diet change as of this Monday at 7 weeks out and has already tightened me up a lot. Its a little drastic to refine the diet midway this much but the theory behind this approach is rather than slowly reduce food amounts into the diet and it feel continually harder as the weeks go on. That at the mid-way point the diet drops significantly and with it a lump of fat/water/weight. Then as the week finishes I go back to the original amounts previously dieting on the week prior and it seems as though I am eating a lot of food. "A joy of a diet"!!!! and allows the coast into the big day to feel a little easier. Plus with the excess fat carried at this stage of the diet there is more of a safe blanket of fat reserves to use now rather than closer to the show when bodyfat is very minimal the chance of losing muscle is obviously greater! see photos, 7 weeks out! nice progress mate, can see some great changes over the past few weeks! Thanks dave- as u know the changes help us through them dark times!! Keep them coming!!!.. Lol how's ur prep going?